In this video, Jennifer Bridges, project management expert, shows you how small projects can benefit from the same kinds of prioritization and planning that large projects require. To avoid the pitfalls she encountered, Jennifer recommended these tips. Pro-Tip: A good planning software tool gives you access to all aspects of your project in one place, wherever you may be. The use of a dashboard is also crucial, in that it provides a real-time window to monitor the progress of your work. Of course, this applies to a large project, too. How else are you going to stay on top of your resources and budget? Today, we’re talking about how to manage small projects. Probably the worst trouble I’ve been in is managing a small project, and it’s because I was trying to do too much, too fast, and taking several things for granted. So, today I want to share with you some tips I learned along the way.First of all, a reminder of what a project is. A project is a temporary endeavor with a defined start and end time and defined scope and resources. In most organizations, small is categorized as having fewer people, smaller budgets, sometimes maybe a lower priority, sometimes maybe a quick turnaround, and it could be one of many projects. The good news about small projects is that not every project needs to be massively planned. A caution about a small project is that the lack of planning can create and cause unnecessary headaches and a lot of rework, and a lot of time. But a reminder is that small projects still need structure in order to succeed too. So, some of the keys are, don’t overkill this project and don’t overlook things that may cause you a lot of headache. If we look at the project lifecycle as identified by PMI, the Project Management Institute, we have the initiating, planning, executing, monitoring and controlling—and the closing phases of the project. And if you look at the little red dots, these are potential failure points. So these points look like maybe lack of estimates, lack of planning and tracking, lack of communication, maybe change control or even lack of planning the resources. So, over time, I’ve learned some things that I want to share with you that’s helpful in managing small projects. First of all, create structure using templates. That will help you save a lot of time along the way. Also, document the processes to enable agility on your project, so people can do a lot more quickly. Also, plan the project to a level of detail required. Again, you don’t want to overkill this, but you do need to break it down to the level that your resources who are working on the project know exactly what they’re supposed to do and when, and what is contingent upon each other. Also, keep everyone informed so that they know what’s happening along the way, and if any changes occur. A best practice and, I submit now, more of a required practice is using a software planning tool. The benefit of using a software tool is having access to all your projects in one place and having access to the dashboards in one place. And that helps you stay on top of your resources and your budget no matter what size your project or organization. 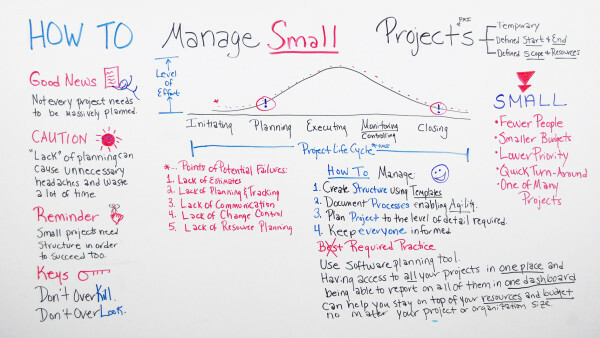 So if you need help managing your small project, then sign up for our software now at ProjectManager.com.